The subject line could possibly be twisted and state America’s take on Mexico’s delicious, and simple baked bread. French bread pizza. What is a mollete anyway? 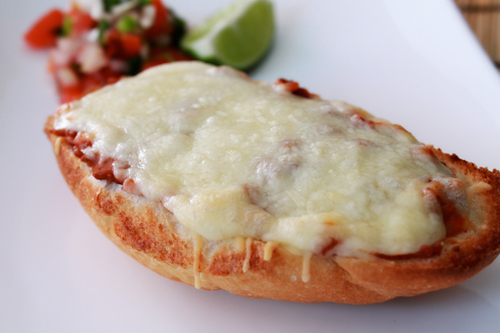 A simple bolillo roll, sliced in half and topped with refried beans, cheese, and a variety of toppings, only to bake in the oven until lightly crisp. In my opinion, the Mexican heritage has many things going on, and one of them is this simple, yet complex dish that adds warmth to a Sunday breakfast. I reflect a lot on the food of which I have grown up on. Much of which is the reason I started writing about my food and recipes in the first place. The gathering at dinner time, the smells after school, and the occasional get together in Indiana. My parents worked first shift, and the protocol, from about third grade on, was to get a wake up call from one of my parents (or an alarm clock), and get ready for school. Fortunately enough, we only lived a block or so away from the elementary school. Going into middle and high school was much of the same routine; get the call, wake up, and get ourselves ready. Thankfully enough, my parents trusted by brother and I, not only with making sure we got ready for school, but also growing up in the kitchen. Sure, elementary school was a table full of boxed cereals, but as we grew older, the gas stove became the game, and eggs, bacon, and toast were what I was cooking before heading out before 7:00 a.m. If only I would have know about molletes at that age. Something so easy, and so diverse in the sense that I could place an egg, ham, bacon, or just simple beans and cheese on top of a piece of bread, it would have been game over. These would have surely warmed the stomach as the hike became so much longer walking to middle and high school, especially in the rain, or snow. My favorite type of mollete is using chorizo, and if you have never had chorizo, you are missing out. Chorizo is well seasoned ground pork, with chili powders, garlic, and a handful of other seasonings. It goes perfect with eggs in the morning (huevos con chorizo), or even with some lightly cooked onions and folded into tacos. Enough with the chorizo, lets get on with the molletes. Preheat your oven to 350 degrees, with baking sheet in the oven. Cook your chorizo by adding it to a skillet, and letting it warm through for a couple of minutes. Once it begins to sizzle, push it down with your spatula, and begin breaking it apart. It will quickly crumble and begin rendering in its fat. Slice your bolillo roll. 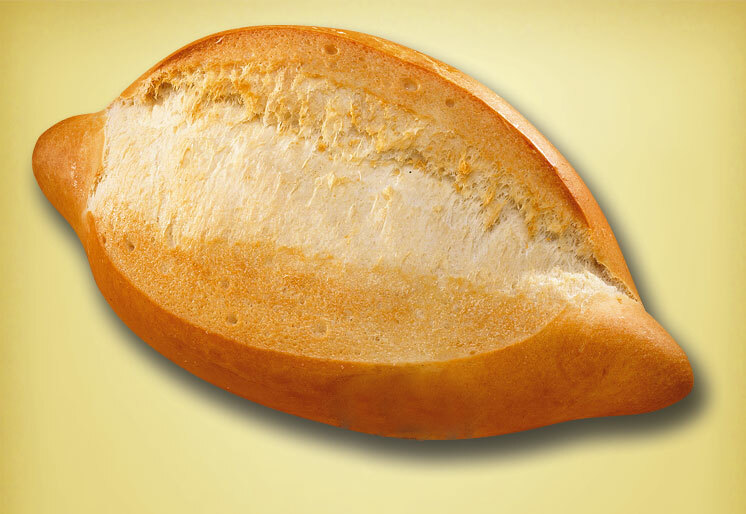 You can find these rolls in most markets nowadays, but definitely in your Mexican supermarket. They are super affordable and typically sell for 3 for 1 dollar. Lightly spread butter on the face of the sliced rolls and place in the oven for about 3 minutes. Remove the rolls from the oven, and spread a generous amount of refried beans on the rolls. Top with the cooked chorizo, and layer shredded jack cheese on the top. Place back in the oven until the cheese turns a light brown and the edges of your roll start to turn color. Your breakfast will never be the same. True warmth and comfort, and a delicious blend of flavors, the mollete is sure to please. Enjoy. i LOVE molletes. nobody seems to know about them though — they are so underrepresented in American Mex cuisine.